Anh Le displays a few of her shop’s many tasty treasures. LA VERNE, October 23, 2017 — According to Bloomberg, 8 out of 10 entrepreneurs who start businesses fail within the first 18 months. But as sobering as though statistics are, sisters Anh and Khanh Le, owners of NothingBundtCakes in La Verne (and Rancho Cucamonga) won’t be one of those dire statistics. As young children, they faced much tougher odds escaping the fall of Saigon in 1975 and repatriating in America with their mother, father, and other sister Thy (pronounced Tea). Their father had been a colonel in the Vietnamese navy — they were members of the upper class — but in America they had been stripped of everything. They weren’t complaining, however, they were glad to be alive. For her parents, that meant doing any work they could find. Anh’s mother cleaned houses. Her father found work in a shipyard. He also found work with a record company, not a fancy front-office job signing musical acts, but actually cleaning the vinyl, the material from which the records were made. “Whatever it took,” Anh said. But with that gritty immigrant determination that has formed the backbone of our country, the family slowly found its way, moving from Los Angeles to Huntington Beach, to Fountain Valley, which today is known as America’s Vietnamese capital. Their community flourished and they flourished. After graduating from Fountain Valley High School, Anh majored in accounting at Cal Poly Pomona, and then for the next 20 years she worked dutifully for several private and public companies. Then life changed, and much of that change was attributed to a single cake. In 2010, Khanh sampled a NothingBundtCake in Las Vegas, which coincidentally is where Khanh lived and where founders Dena Tripp and Debra Shwetz opened their first NothingBundtCakes location (today there are more than 250). 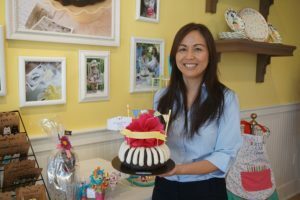 Khanh asked Anh if she would consider being her partner in opening a franchise, but as amazing as the cakes were, the timing just wasn’t right for Anh. “My children were really young and my husband was traveling a lot,” Anh said. But three years later, Khanh came knocking again, and her persistence paid off. While Anh had decided to take some time off and be a stay-at-home mom, the idea of doing something different and taking up a new challenge appealed to her. After using her accounting mind to vet the business model, she liked what she found. Their model was based on simplicity — four sizes, 10 flavors and 40 decorating designs — and they had a flawless, teachable process. Anh was all in, and pretty soon she was up to her elbows in flour as she went back to Texas for almost a month to learn the proprietary NothingBundtCakes system of creating perfectly moist cakes made from premium ingredients and crowned with their signature velvety frosting. “The frosting is so delicious that you could spread it on meatloaf and it would taste good,” said Anh, who has infectious sense of humor. 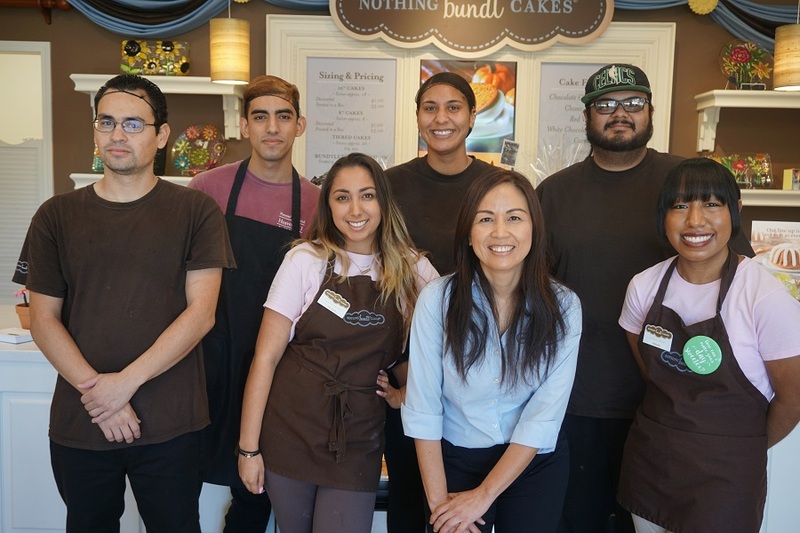 About four years after Khanh had tried her first NothingBundtCakes, Anh and Khanh opened their first store in Rancho Cucamonga in 2014 — the first in franchise history to open in the Inland Empire. But as good as they knew their product was, they also knew they faced a sizable marketing challenge. “When we opened, we found that 95 percent of people had never heard of the brand,” Anh said. But again, she and her sister didn’t let some unfavorable odds be the influencing factors in their success. Rather, they hit the streets, literally putting “cakes in mouths,” and getting the public and local businesses to give their cakes a try. Customers can choose from more than 40 decorating designs to help celebrate any occasion. Their blitz was so successful that the Anh and Khanh decided to start looking for a second NothingBundtCakes location, with their sister Thy (pronounced like “tea”) managing the store, making it a family-run business. They almost opened in Claremont, but when they couldn’t find the right location, they decided to open in La Verne. They signed the lease in January and opened on Memorial Day weekend. Claremont’s loss was La Verne’s gain. “We liked the anchor tenants here — Stater Brothers, In-N-Out, the Tenderloin — and the landlord was gracious enough to remove all the shrubs that had hurt the visibility of the shop,” Anh said. As the sisters pulled permits, one other factor struck them, especially since La Verne was a mature town. “I found out there was no other bakery in La Verne, I was really surprised,” Anh said. Another surprise has been Anh Lee herself. Interestingly, before she decided to join her sister in the baking business, she had pleaded the case that she didn’t know anything about retail. She had been the one behind the computer helping other retail businesses be successful. Brian Parra, Eric Portillo, Members of Anh’s army include Rosalind Thorbourn, John Cazarez, Rachel Sanchez, and Celeste Gonzalez. Not pictured is Anh’s sister Thy, who manages the La Verne store. Well, she is a retail and marketing maestro. As for the physical properties of the shop, it is as expertly decorated as the cakes. The walls are a buttery yellow with accents of chocolate brown and robin’s egg blue — a throwback to mom’s kitchen. Maybe the last, but perhaps best, surprise awaiting customers is something they won’t actually see. There is a small army of bakers, frosters and decorators behind each bundt cake, bundlet or bundtini that goes into the display case. The bakers bake, the rosters frost, and the decorators decorate, although that doesn’t mean some cross-training doesn’t go on. NothingBundtCakes has achieved perfection, and a perfection is always worth a visit! NothingBundtCakes offers items at every price point and for every occasion — from a breakfast meeting where you get to impress your coworkers with something besides the usual Pepto Bismol box of donuts to an over-the-top wedding where multi-tiered bundt cakes are surrounded by a sea of bundtinis. 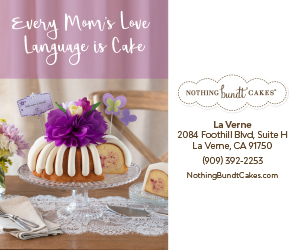 NothingBundtCakes is located at 2084 Foothill Blvd., Suite H in La Verne. Hours are Monday through Friday, 9 a.m. to 7 p.m. and Saturday, 10 a.m. to 6 p.m.
For more information, call 392.2253. Oh, and remember those statistics that say 8 out of 10 businesses fail, well, the 20 percent that make it, must be NothingBundtCakes shops! Quality and hard work don’t know failure!